I cannot thank everyone enough for making yesterdays 6 Reds Tournament such a special day. Peter and Mark Mcintyre especially, for making the journey from the Far East (Norfolk), it was great seeing them. They were not so fortunate in the competitions but won the longest drive. Bob Mason for his fantastic support over many many years in allowing the league use of his tables at Woking Snooker Centre and all round contribution to snooker at league and national level. But above all the leagues members who put themselves out to raise money for 'one of their own'. A special personal thanks to George Middleton for his enthusiasm and help in everything, in the league. 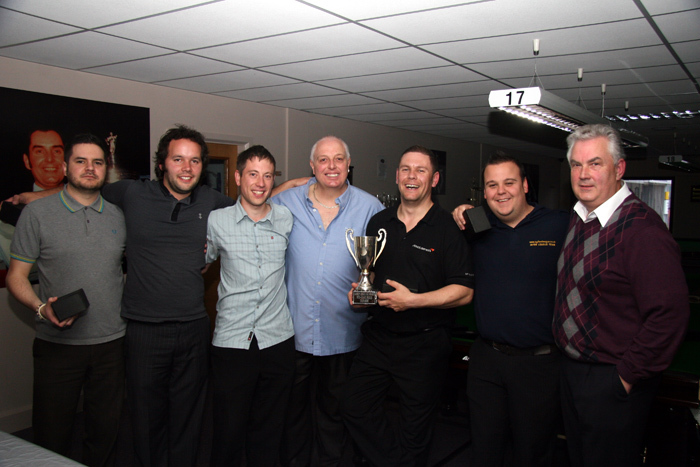 Every player, there was 27 entries, for a great atmosphere with some good snooker played. The star of the event was Sean Harvey who played excellent snooker all day and deservedly won the main prize. Its really great for the league to have Sean back. What a player. Trevor Connors won the highly contested Plate competition, for the second time, and James Popplewell made the highest break of 54. Asad, a Woking Snooker Centre member, won the raffle. Thanks to all who contributed the day raised £400.00. Fantastic. Well done.